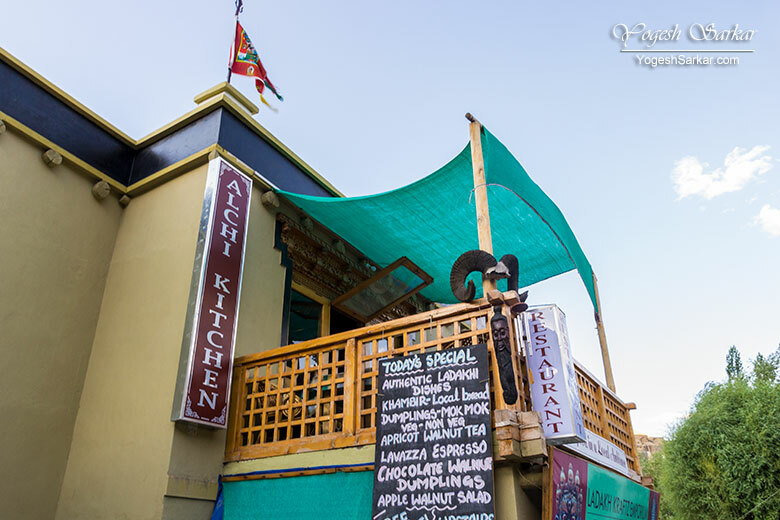 Don’t forget to visit Alchi Kitchen in Alchi; these were the words Otsal had said when we left for Lamayuru in the morning. Before that, he had been lavishing praises for this newly opened restaurant during our morning chat. So when we did end up visiting Alchi while returning from Lamayuru, Otsal’s words were echoing in our mind and hence we started looking for it. Finding it wasn’t all that difficult since it was located right at the beginning of the Alchi Market. We climbed up a small flight of stairs to reach this cozy little restaurant, comprising of all lady crew. Even though we had the option of choosing to sit in one of the two balconies overlooking Alchi, we decided to sit inside, in front of the open kitchen. 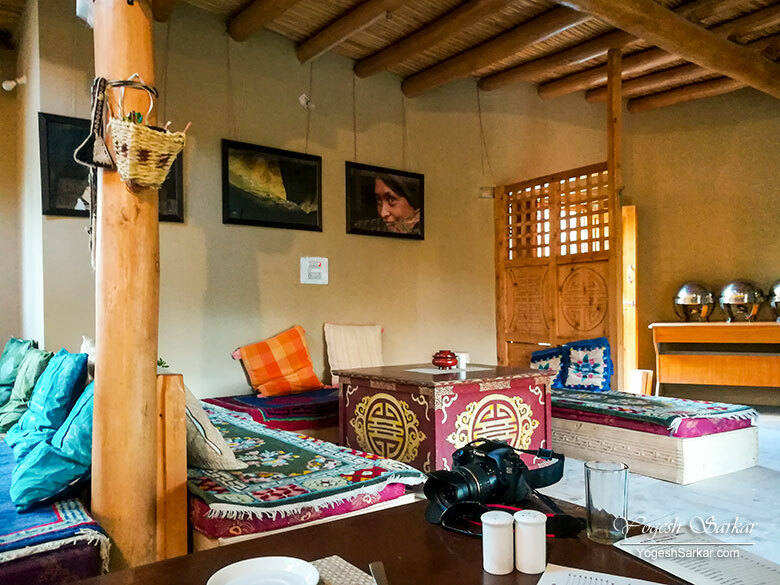 The walls were adorned with beautiful photographs of Ladakh, while the décor was authentic Ladakhi, lending a lovely ambiance to the place and helping put a smile on our face, without even ordering anything! Add to that, with all the praises Otsal had lavished in the morning, we had high hopes for this place. So with much interest, we went through the menu and ordered food. 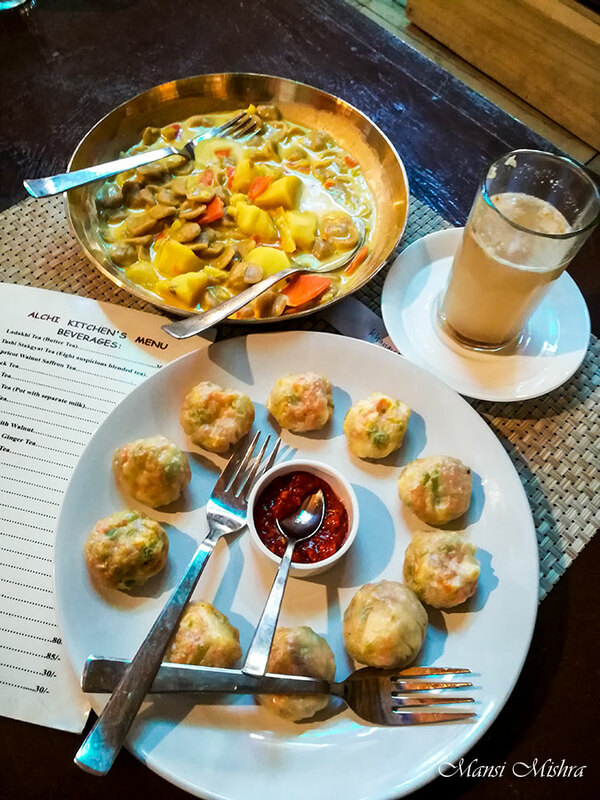 I decided to play it safe and ordered Cinnamon Tea along with Mok Mok Cheese (processed cheese, cottage cheese, and mixed veg dumplings). I had learned my lesson long ago to stay away from thupka and other similar noodle soups. Because even though they might be quite fulfilling and local food of Ladakh, they taste bland to me, since I am used to North Indian food and flavors. And I find it next to impossible to finish them off. Mansi on the other hand, hadn’t learned that lesson and that along with the fact that she really wanted to try out skyu (Ladakhi pasta in the shape of a cap), she decided to order O-Skyu made in milk sauce with potatoes and peas. 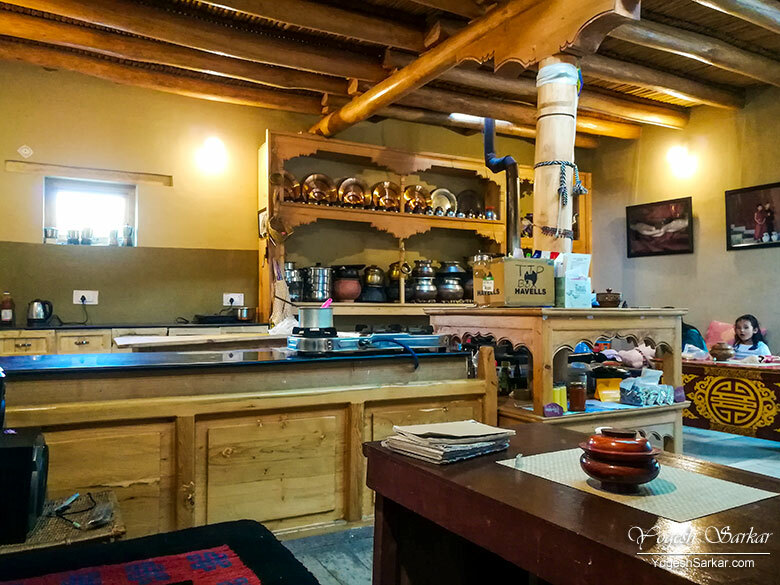 We had the front row seats to see our food being prepared in the Ladakhi style kitchen. Here they even teach you how to cook, if you want. Making it a perfect place for a foodie to spend an afternoon or even an entire evening. Soon our food was served. Cinnamon tea and Kahwa were superb! Mok Moks, on the other hand, were delicious as well! Served with spicy red chutney (non-traditional), they were about the best momos I have ever had! O-Skyu had a unique flavor to it, sort of milky with a somewhat raw taste of wheat flour. It was certainly something entirely different, but I had my Mok Mok in front of me, so I dived into them instead. And Mansi, well, she tried to finish it the best she could, but eventually gave up. Having said that, she was satisfied with the fact that she at least tried it out. 5 points to remember about traveling to Leh-Ladakh! Ladakh Winter Trip, Santa comes early!